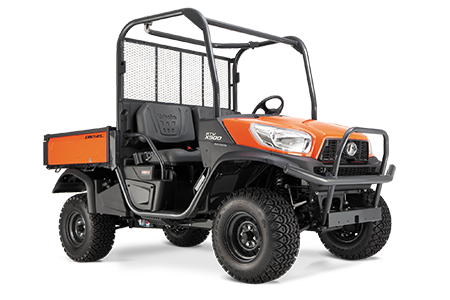 Get to work with Kubota’s rugged and heavy-duty RTV-X900W-H. Powered by a reliable Kubota 21.6HP, 3 cylinder diesel engine, the RTV-X900W-H is complimented with a smooth VHT-X transmission, strong steel frame, independent rear suspension and worksite tyres. 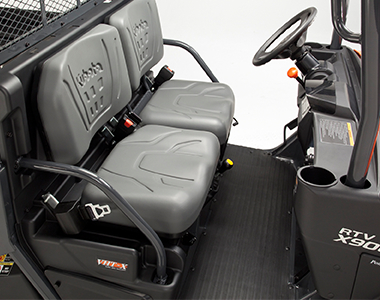 While it may be tough and rugged, the RTV-A doesn’t skimp on luxury, featuring more leg room, deluxe split-bench seating, digital panel and additional storage, providing an incredibly comfortable ride for those long days out on the worksite. 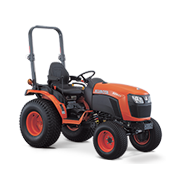 Powered by a Kubota 21.6HP liquid-cooled diesel engine for long and strenuous tasks. 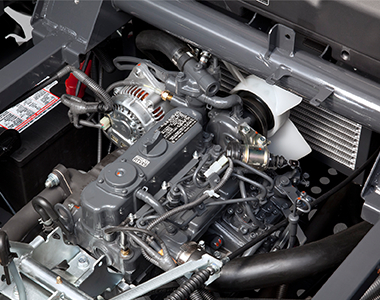 Advanced VHT-X offers a wide torque band and large oil coolers that boosts performance and durability. CV joint protectors and heavy-duty skid plates protect the most critical parts of the engine and transmission. 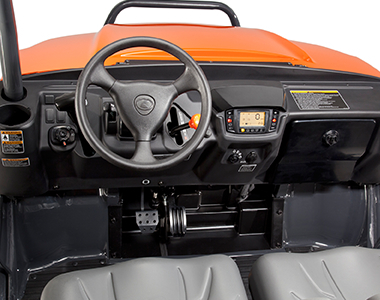 Shift less often and maintain better control with Kubota’s transmission gearing. With just two forward speeds (high and low), neutral and reverse. Regardless of the terrain or load, independent suspension on all four wheels ensures a truly exceptional ride. 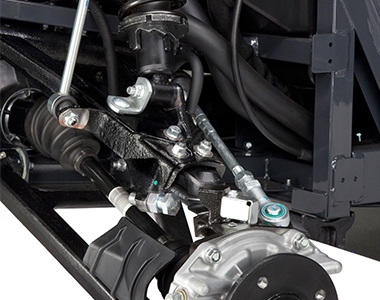 Kubota’s heavy duty IRS (Independent Rear Suspension) technology sets a new standard in durability. The rigid steel frame isolates the occupants from noise and vibrations. Designed to withstand frequent, heavy loads for years of dependable use. Radiator and air intake located high and up front, where the air is cleaner and cooler, for simple maintenance and improved radiator performance. 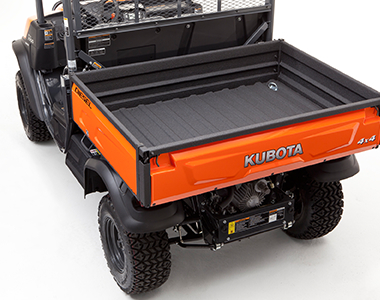 Kubota’s wide fin pitch design minimises clogging, further improving radiator performance. 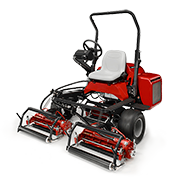 Features full 263mm with 205mm of suspension travel, letting you glide easily over bumps. True 4-wheel drive with a limited-slip front differential and a locking rear differential helps reduce wheel spin to a minimum, giving you greater control and a smoother ride on rough or muddy terrain. Dynamic braking provides additional braking power and greater driving control. Ergonomically designed split bench seats provide hours of riding comfort. Responsive hydrostatic power steering gives you the control you need to take on any terrain with ease. The steering wheel tilts, allowing you to set the optimum angle for your driving style. Digital meter cluster is bright with large, easy-to-read indicators to keep you informed of all critical driving conditions including; speed, hours and miles. Overheat alarm (light and audio) helps prevent engine damage. Parking brake is conveniently located on the dashboard for easier access as well as more legroom. Large glove box on passenger side provides fast access to critical tools and personal items. Large compartments under the split bench seats provide plenty of convenient storage space for tools, tie-downs and personal items. Heavy-duty steel cargo box carries up to 500 kgs of materials such as tools, firewood, gear or supplies. Cargo tie-down hooks come standard to keep your gear secure. 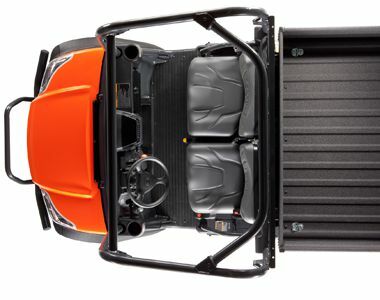 With the flick of a single lever, the hydraulic-lift cargo box rises and cargo slides out.